All I'm saying is, we found a license plate. And if it's yours, you can come up and get it. No, we don't have the car. We definitely don't have the car. 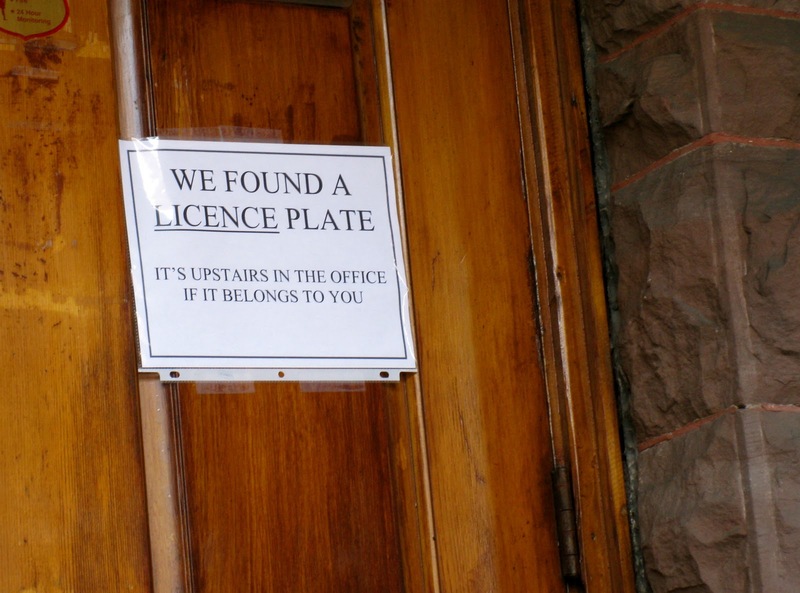 For one, how would we get a car up those stairs, and for two, if we found a car, why would we just say we found a plate? Money? Ha! First of all, if we had your money, we'd be out spending it and not here talking to you. Second, how would we know it was your money? It's not like you put your name on your money. Oh, the money was in your wallet and your wallet had your name on it. I see. Well, I would see if we had your wallet, but we don't have the wallet or the money, so I don't see. Your girlfriend? We definitely don't have your girlfriend! 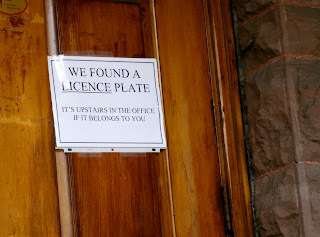 Because for sure if we had your girlfriend, we'd put that on the sign, since having somebody's girlfriend is much more important a thing to put on a sign than having someone's plate. Oh. You found your gun. Good for you. Nice to see you got something you were missing. It feels good to recover a missing something, doesn't it? Okay, we've seen it. You can put it away now. You don't want to put it away? You want us to look at it again. Oh. You want us to look closer at the barrel of it, and try to remember if we found more than just the plate.